Extra strong toolbox with all the necessary tools to remove and install your press-fit bottom bracket. Suitable for: BB30, PF30, PF86-92, BB90-95. Protective foam inserts keep the tools in place. 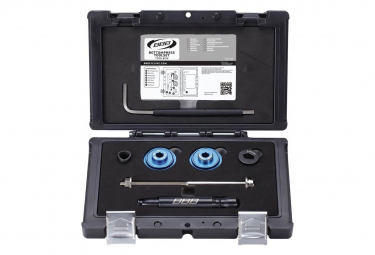 Set contains: 2 bearing press cups, 1 bearing removal tool and 1 cup press rod. Height x width x length (mm): 64 x 310 x 200.